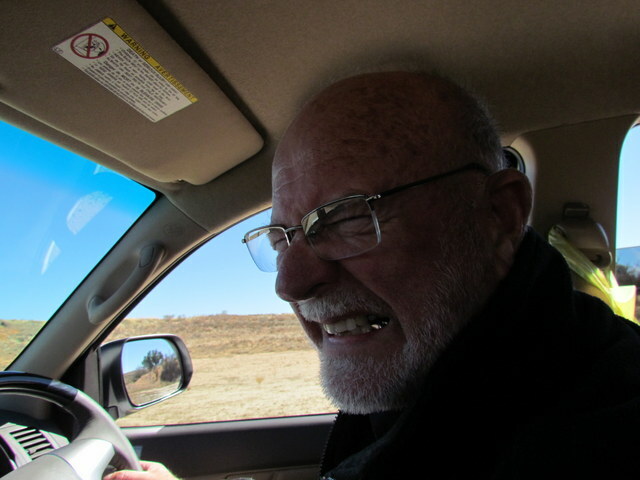 You can, if you are brave and not particular about your motor vehicle, travel the roads of The Kgalagadi Transfrontier Park in an ordinary sedan car. We have done it twice in my Volkswagen Caravelle which is four motion. But we found that it was expecting a bit much and ever since the first shake up of a trip we suffered the consequences as the poor vehicle had its insides and parts severely shaken up and it was never the same again! The plan this trip was to take Earl’s Toyota Hi-Lux twin cab – not as comfortable as my Caravelle but it still had plenty of room to pack the catering equipment and luggage for four travellers. Earl has never been completely happy with the afore mentioned Toyota which he’s had for about a year. The back didn’t seal well. He was afraid everything would be covered in red dust. It was an automatic and he didn’t like the way it handled on the road and the list went on. After having a special holiday service something went wrong and that sent him over the edge and the day before departure he arrived home with a brand new Toyota Fortuner. Well! All very nice and comfortable with tinted windows (just done and couldn’t be opened for 48 hours) BUT what about the packing space! He should really have purchased one of those aerodynamic roof rack thingies with bags that fitted snugly in included but there was not time for that! He arrived home late on the day before departure. Our travelling companions had dropped off their luggage and now the Magiver manipulation began to get everything in and leave room for the passenger. Talk about canned sardines – we were canned tourists for the next 10 days! Having said that – it all worked out and got the packing an unpacking down to a fine art for the rest of the trip! I am always like a kid before Christmas the day before departure and so of course I was too excited to sleep. I must have dropped off an hour before the alarm went off at 3:30 a.m. Typical! But I was up and out of bed like a shot and soon we were picking up Peter and Heather in Fish Hoek and we were on the road on schedule. 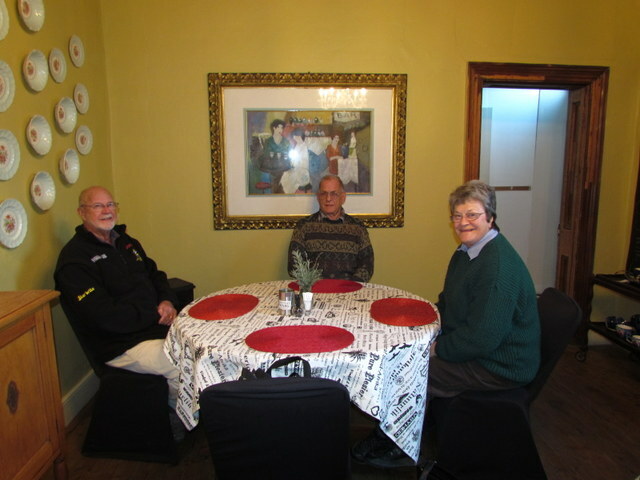 We stopped at Muis Huis in Van Rynsdorp for breakfast and spent the night at Kalahari Guest House just outside Upington. Our hostess cooked us a delicious three course dinner – mushroom soup, babootie, roast leg of lamb with sweet potato and vegetables followed by Melba pudding followed by Melba pudding and custard. She also gave us a packed breakfast – toasted cheese and tomatoe sandwiches, yogurt and juice. I thought cold toasted sandwiches would not be so great but they were delicious! It was freezing when we got up but we dressed in layers knowing that the days warm up considerably – so it was a short sleeved shirt, jersey and warm jacket over jeans and shoes and socks all wrapped up in scarves, beanies and gloves. By the time we reached Twee Rivieren we were beginning to peal off the outer garments! Before entering the gate we were treated to a wonderful sighting of this magnificent eagle. We checked in at around 10 o’clock but could not get into our accommodation before 2 so set off for our first game drive. 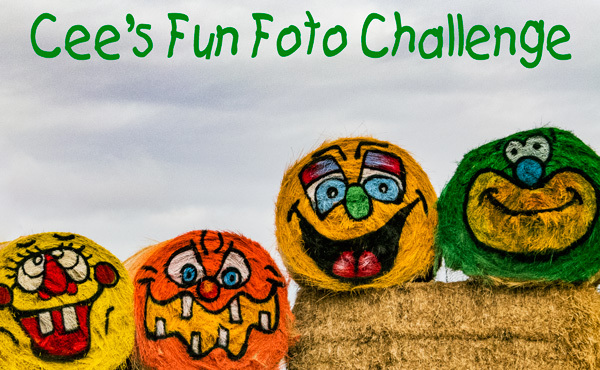 Everything is exciting on the first day so the cameras were clicking furiously as we stopped for every creature. 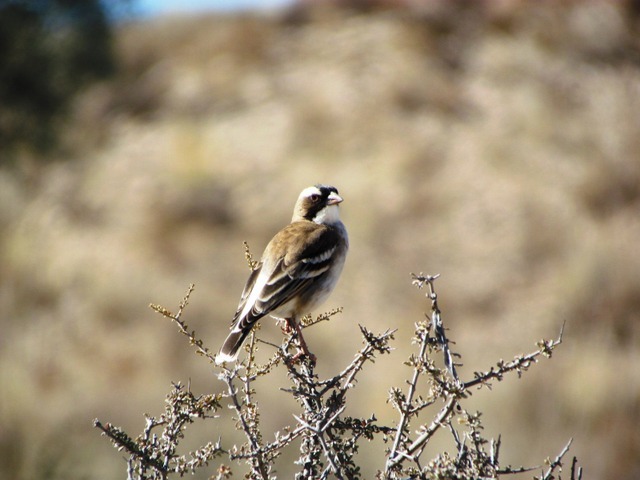 The white-browed sparrow weaver is a common resident in these arid parts. 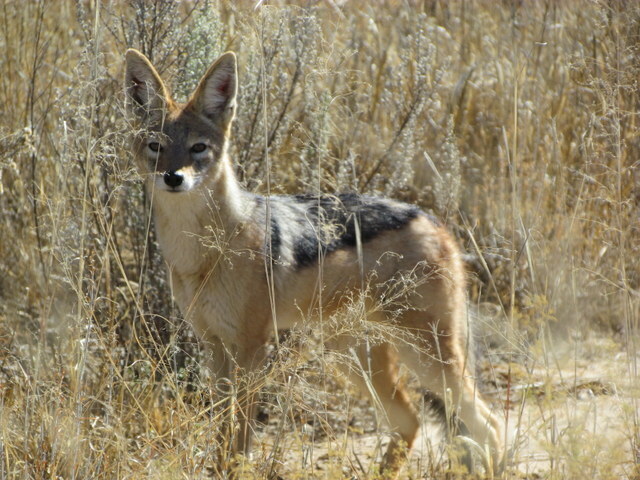 The black-backed jackal was not too shy to greet us. It was good to find our National Mammal – or Rugby Buck as my grandsons used to call it. These beautiful antelope were everywhere and we never tired of watching their antics. 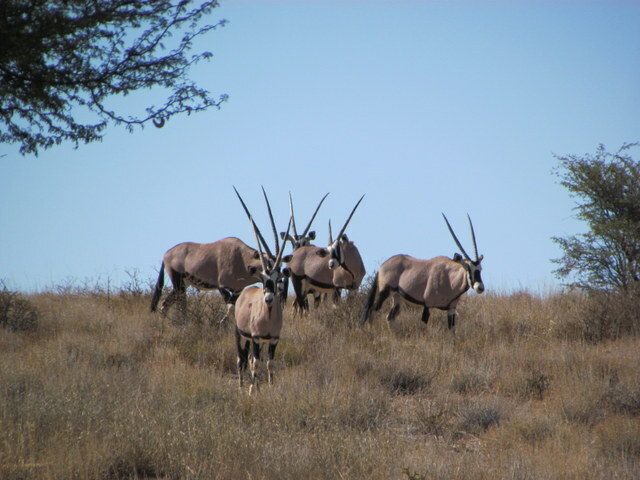 The Kgalagadi was formerly known as the Kalahari Gemsbok Park and was originally created to protect these handsome creatures. 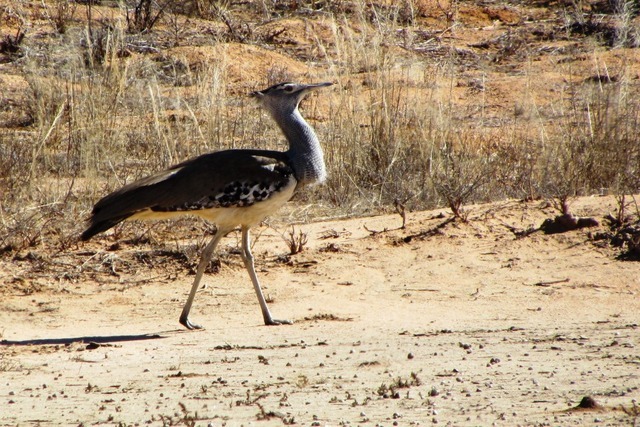 The Kori Bustard is the heaviest flying bird in the world. He is a magnificent bird and we get really excited if we spot one. This beauty proudly showed himself early in the trip. 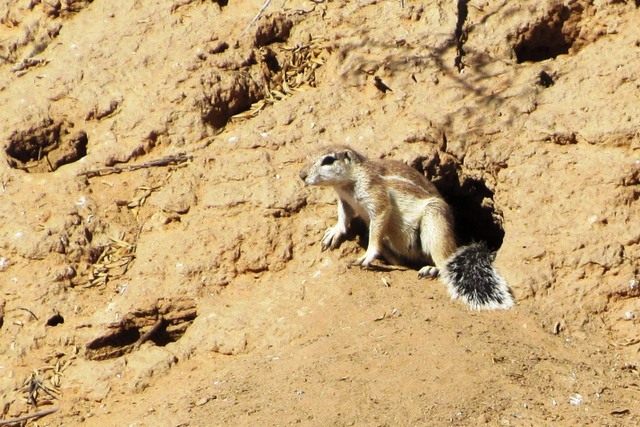 Another common resident of the Kalahari is the ground squirrel. These cute, cuddly creatures are my favourite. I just love their bushy tails and cute manners. Earl started complaining that his muscles were sore – I told him to stop being grumpy so he showed me GRUMPY. Watch this space to find out why he was grumpy! 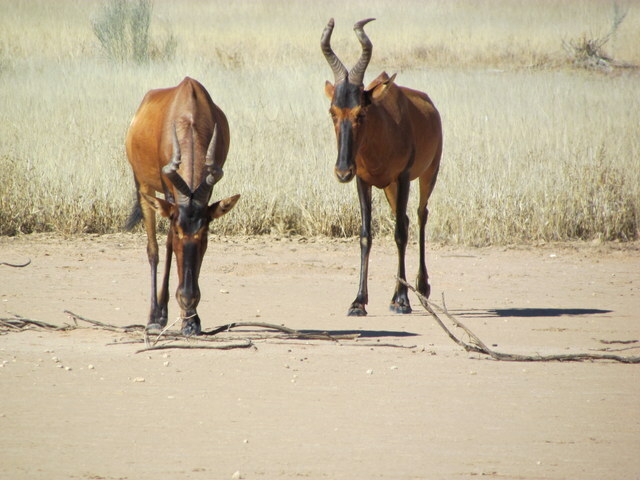 The last pictures we took were of Red Hartebeest – lovely to see – and then we went to check into our family chalet. Twee Rivieren did not have a more comfortable bungalow for us so we had to settle for one with one bedroom and a kitchen with two beds in it! You had to walk from the kitchen through the bedroom to get to the bathroom – but we managed and it was only for one night. Once unpacked we set off for another brief game drive. 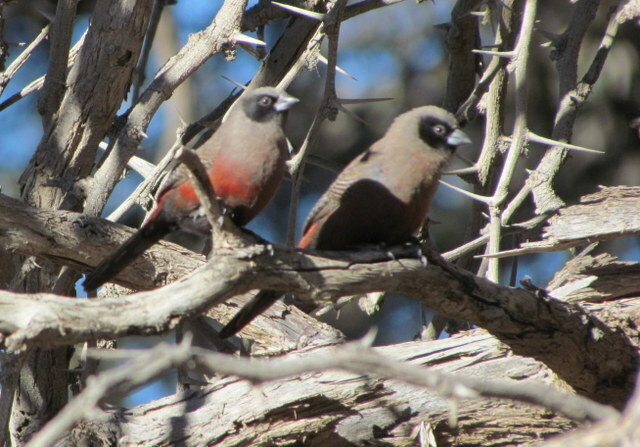 We found these beautiful black faced waxbills just outside the gate. 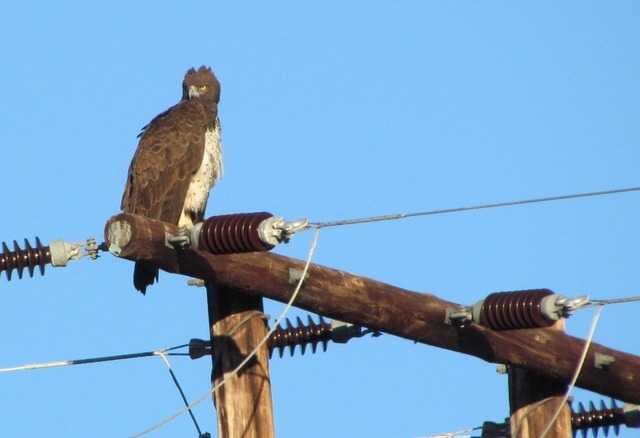 The Kgalagdi is home to many small rodents and birds and so it is not surprising to find a variety of birds of prey. Lanners and red-necked falcons both prey on small birds and look pretty similar. 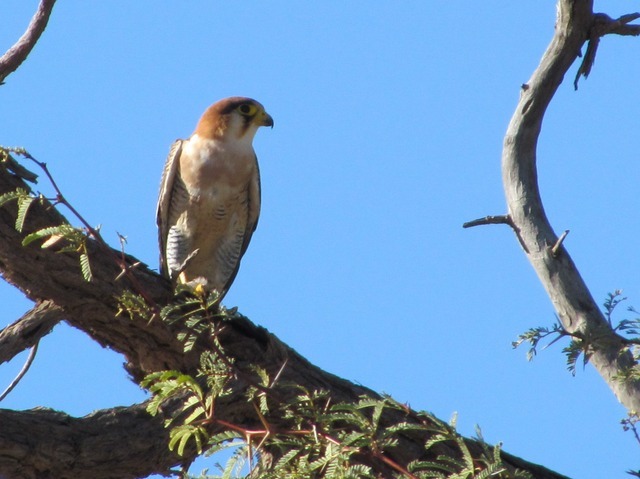 This one is a red-necked falcon – it has finely barred underparts whereas the Lanner has none. 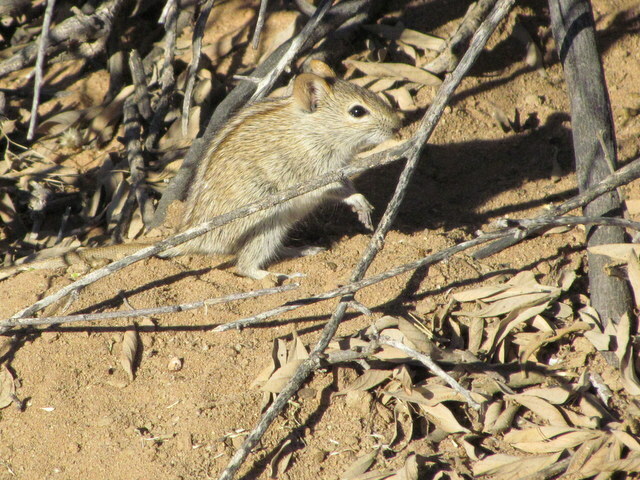 One of the little creatures that has to keep a constant look out for raptors is this cute little whistling rat. We had great fun watching him and his mates. 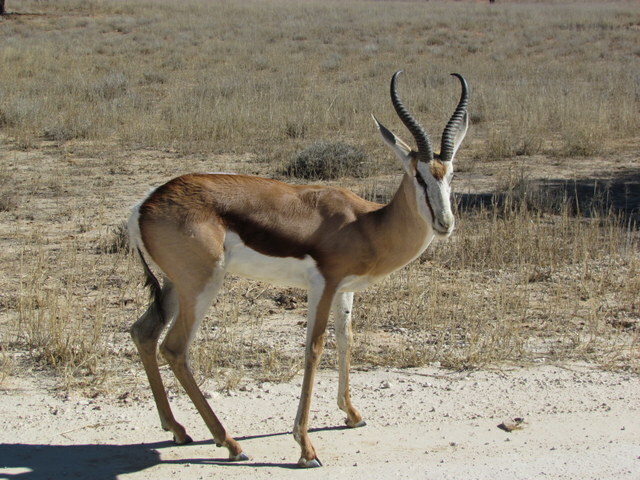 The colours of the Kgalagadi are beige, stone, brown, cream, pastel greys and blues, pinks and mauves. 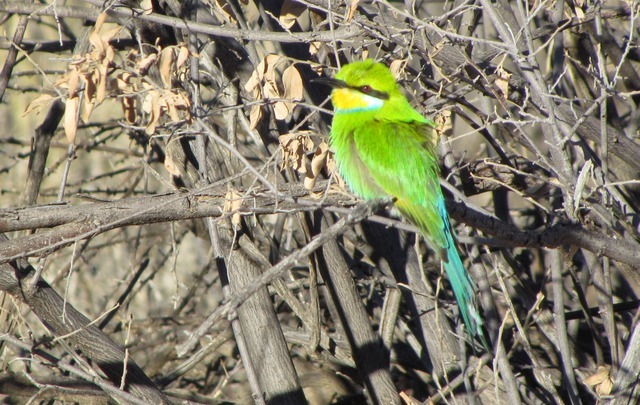 Now and then you get a splash of brightness like this swallow-tailed bee-eater. 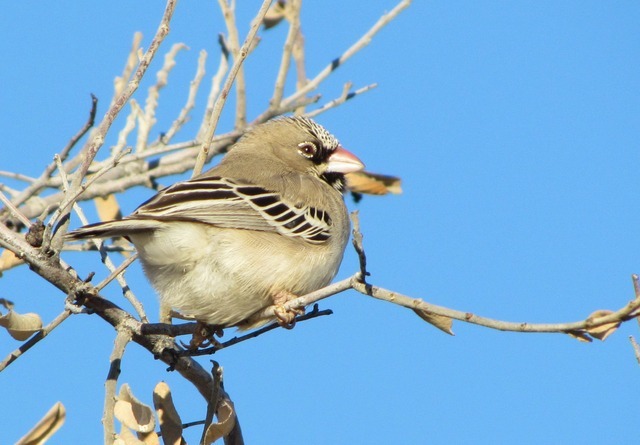 Just as beautiful but not as brightly coloured, the scaly feathered finch is a common resident and appears frequently with flocks of friends. 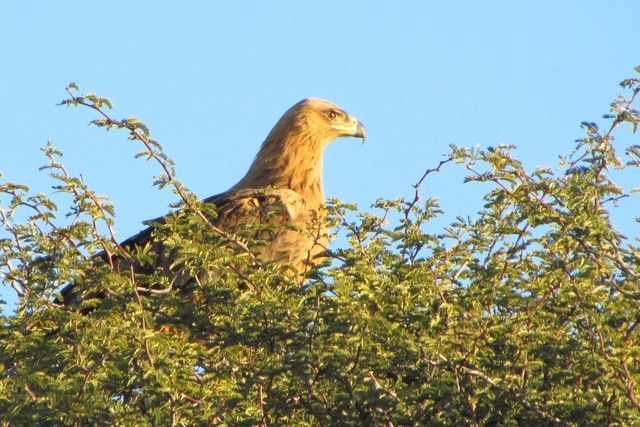 As our afternoon drive took us back toward the gate – closing at 6 o’clock – we watched a tawny eagle fly over and then settle in a tree giving us a good photo opportunity. Altogether it was not a bad start to our trip. As the sun set the temperature dropped and we added our discarded layers and sat outdoors to enjoy a good South African braai before tucking up into warm beds to rise early and continue to our next camp – unfenced in the wilderness – Urikaruus!